Facebook for work. Yes, you read that correctly. Not Facebook for Business (which is Pages and Ads). This is Facebook’s next big move in terms of product. ‘Workplace’ by Facebook has been long coming and I, for one, am very interested to find out more. This is a solution to the inter-colleague conversations that do not need to be on email and currently are being “managed” through Skype, Facebook Messenger and Slack. Let’s dig in and find out about how this form of Facebook will work for your organisation. 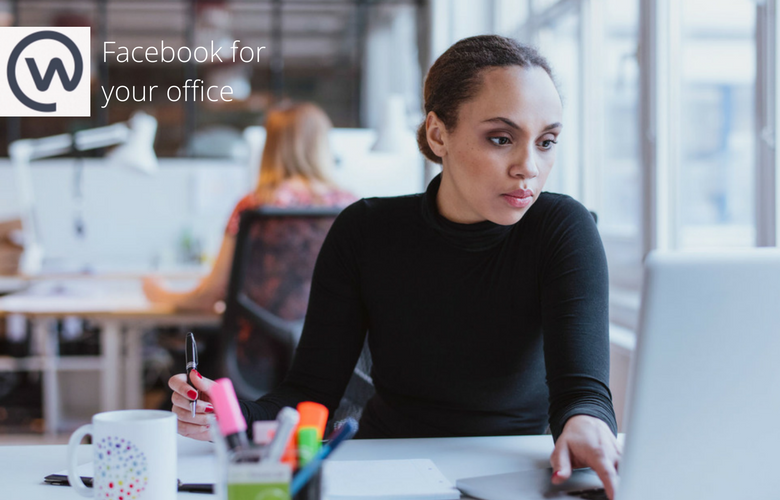 I first caught a glimpse of this idea of using Facebook for work in September 2016, when Julien Lesaicherre (‘Workplace’ by Facebook’s EMEA Lead) talked about extending Facebook’s vision of connecting people, to the workplace environment. (He presented at Social Media Week in London). He shared how Facebook could see that employees and organisations were already trying to do this in the shape of Facebook Groups. Businesses like Tesco and other large employee heavy organisations were creating groups for 6,000 to 15,000 people. Somewhat untenable in terms of “keeping up” and ensuring everyone is seen and heard. The trouble with Groups is you can lose important announcements within the feed right? So, Facebook has buckled down and re-imagined the workplace to give organisations the beauty of Facebook – but give them the ownership of their own space and data. I am really keen on looking at this I have to say. As an agency, we have pretty complicated communications that take place – i.e. from within our own team (who are virtual and not all in the same time zone), to collaborating with partners on certain projects and then of course our own communication with our clients (which is heavily email based at the moment, even for the smallest of “chat”). While we do use Skype pretty heavily – at the back of my mind has always been…there has to be a better way than this. Also my ideal situation is where our “chat” can be protected and also archived for future needs. What has stopped me from using other tools is pricing levels (which are confusing), positioning of “private channels” and the niggles around trying to collaborate with outside people….seamlessly. Julien has said, to allay any fears, that “This is for your company, it’s a private space. You own the data.” So that should be the first element to set your mind at rest – if that is a worry for you. Your Workplace Facebook account will be separate to your personal Facebook account. You will not need have a personal Facebook account in order to use Workplace. I imagine this to be something similar to what Facebook Page administrators see. Workplace is said to have one-to-one support for administrators as well as an analytics dashboard. This will be really handy to know who is accessing or sharing what content, and who is active and who is not. Facebook has also said that it will open the API for organisations to build more integrations for themselves in integrating Workplace into their systems. Magic question: How much is this going to cost? I thought I would just include a screenshot here direct from the Workplace website for you (see below). I’m loving the pricing strategy (which they can afford to do, based on their infrastructure and the big user take-up they will have), as well as that you are only charged for “active” users. Love that! In summary – I’m keen to see this in action, as it would solve some headaches for me to be honest. But the proof of the pudding…is in the eating as they say. In the video below – which I published on our Facebook Page, you will see a bit from me putting this new product in perspective of the modern workplace environment, as well as the official product launch video from Facebook. Have a look – see what you think! I would be keen to hear how you think this will work in practice and whether you think this may solve some pains for your business…in terms of an “enterprise social network” that may well provide the space for closer working relationships and knowledge sharing. Or maybe you are just sceptical…?